State rep. by S.H.O. CID P.S. This petition filed is u/s 438 of Cr. P.C. seeking, anticipatory bail for the release of the petitioner / accused in the event of arrest. 2. The petitioner is the fifth-accused in the FIR. 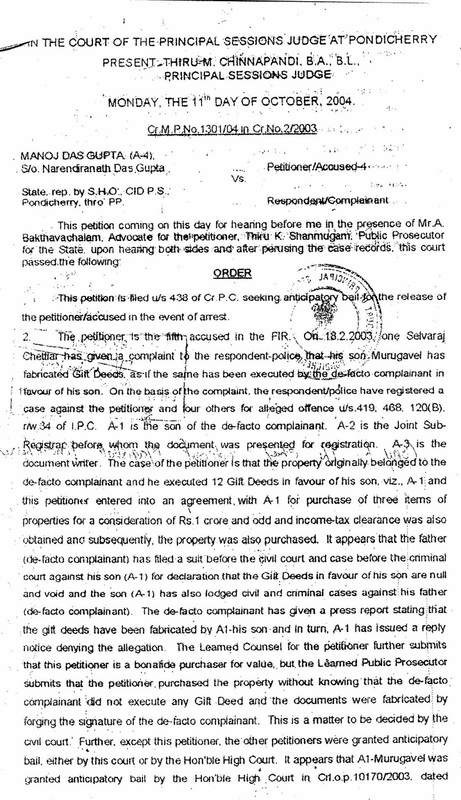 On 18.2.2003 one Selvaraj Chettiar has given a complaint to the respondent-police that his son Murugavel has fabricated Gift Deeds as if the same has been executed by the de facto complainant in favour of his son. On the basis of the complaint, the respondent / police have registered a case against the petitioner and four others for alleged offence u/s. 419, 468, 120(B). r/w. 34 of I.P.C. A-1 is the son of the de-facto complainant. A-2 is the Joint Sub-Registrar before whom the document was presented for registration. A-3 is the document writer. The case of the petitioner is that the property originally belonged to the de-facto complainant and he executed 12 Gift Deeds in favour of his son. viz., A.1and this petitioner entered into an agreement with A1 for purchase of three items of properties for a consideration of Rs.1 crore and odd and income-tax clearance was also obtained and subsequently, the property was also purchased. 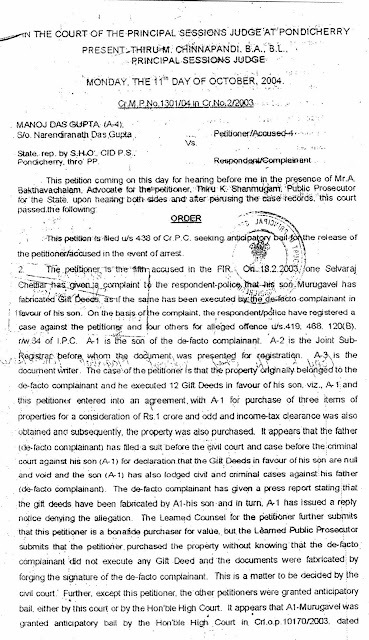 It appears that the father (de-facto complainant) has filed a suit before the civil court and case before the criminal court against his son (A-1) for declaration that the Gift Deeds in favour of his son are null and void and the son (A-1) has also lodged civil and criminal cases against his father (de-facto complainant). The de-facto complainant has given a press report stating that the gift deeds have been fabricated by A-1 his son and in turn, A-1 has issued a reply notice denying the allegation. The Learned Counsel for the petitioner further submits that this petitioner is a bonafide purchaser for value, but. the Learned Public Prosecutor submits that the petitioner purchased the property without knowing that the de-facto complainant did not execute any Gift Deed and the documents were fabricated by forging the signature of the de-facto complainant This is a matter to be decided by the civil court. Further, except this petitioner, the other petitioners were granted anticipatory bail, either by this court or by the Hon’ble High Court. It appears that A-1 Murugavel was granted anticipatory bail by the Hon’ble High Court in. Cr. o.p. 10170/2003 dated 2.1.4.2003. Considering the factual position and other circumstances of the case inclined to grant anticipatory bail to the petitioner. In the result the petition is allowed. 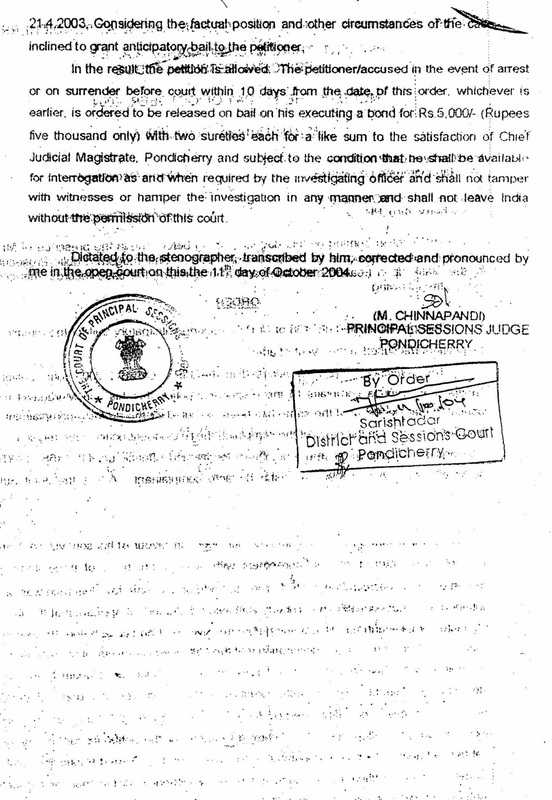 The petitioner / accused in the event of arrest or on surrender before court within 10 days from the date, of this order, whichever is earlier, is ordered to be released on bail on his executing a bond for Rs.5,000/- (Rupees five thousand only) with two sureties each for a like sum to the satisfaction of Chief Judicial Magistrate, Pondicherry and subject to the condition that he shall be available for interrogation as and when required by the investigating officer and shall not tamper with witnesses or hamper the investigation in any manner, and shall not leave India without the permission of this court.